find various commentaries and interpretations on a selection of her original paintings. This painting is one of deep personal significance for Ava Lee. It is, in essence, her story, and that of her family - the roots, the wings; the past, the present. And yet, it is also a universal story of our Jewish people. Some of the imagery includes the broken hearts, the pool of heart-shaped tears, the falling leaves. However, a dove flies high above, bearing not only an olive branch, but also a music note and a paint brush. Tambourines represent those of Miriam, considered by many to have been the first female music therapist. The ancient and modern harps represent the journey of music therapy from days long ago to the present time - commencing with David employing music in soothing and healing King Saul from "dis-ease" of mind and spirit. The musical passage consists of a few phrases from a Yiddish song which hearkens back to the golden age of Jewish Theatre. It concerns itself with the emotions of separation involved in journeying from the "old" country to the "new" land - a tribute in blessed memory of Ava Lee's grandparents. The Tree of Life, with its strong roots and inevitably changing seasons, is also represented. Both the tablets of the Ten Commandments and the Torah are clearly visible. Where the tonal values darken in some areas towards the bottom of the painting, they are illuminated by the light of the Shabbat candles and the Channukiah. The shofar, the grapes, the wine-filled cup, the challah, the matzoh, are all to be seen on the rungs of Jacob's Ladder - along with numerous other Jewish signs and symbols, so beloved by Ava Lee. 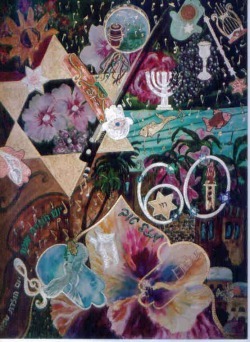 Ava Lee is honoured and happy to announce that this painting has been the one selected to grace the front cover of the current 2010 - 2012 issue of the "Greater Vancouver Jewish Telephone Directory". The deafening silence of so many lullabies unsung: I hear them: I see them too. I am reminded of the admonitory directive of Eli Weisel, stating that we must always "remember". This advisement beats in reverberating rhythm in my heart. I was not there ... but I "remember". The alternative methods of addressing sorrow and pain play a continuous fugue in my soul and spirit. In "Slach Sarfei Kodesh", vol.2, p.92, #318, quoted in "Man's Quest For God", Abraham Joshua Heshel writes, "There are three ways in which a person expresses his deepest sorrow: the person on the lowest level cries; the person on the second level is silent; the person on the highest level knows how to turn his sorrow into song." And so, I "hear" these two watercolour paintings. The lullabies are songs of silence. The instruments remain untouched; the notes remain in repose. The hearts are torn; the blood flows; the leaves turn to fall colours in springtime. Our "Shir Hashirim", our beloved children, are nowhere to be heard. Names of our lost sons and daughters waft and billow throughout the paintings. The black ribbon of mourning sits close to the watchful eye of God. However, the Eye in each painting focuses on the butterfly, reminding us that "Butterflies are Free." The dove, and few flowers that manage to flourish amidst the dying leaves, are promises of some semblance of hope and peace ... a vision to help in transforming our collective sorrow into song. This painting was originally conceived over two years ago, when my first grandchild was about to enter Vancouver Talmud Torah preschool! My grandson is now in kindergarten, and my granddaughter has taken her brother's place in preschool. I was (and am) filled with overflowing emotions and abundant memories, particularly as my four sons are all Vancouver Talmud Torah alumni. My mental images travel back and forth in interwoven threads; a tapestry emerges. Joyous thoughts, memories, and anticipations have paved the path for this watercolour. I have painted it with Jewish children in mind, and have used a variety of techniques to encourage the young students (along with their parents!) 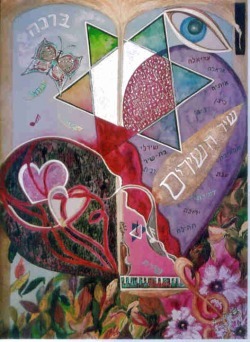 to engage in finding Jewish images and motifs within the artwork. 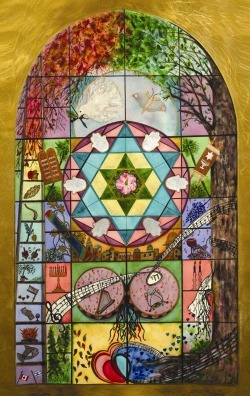 The major Jewish Holy Days and Festivals are represented by various images along the journey. For these, I have chosen to use gold, silver, and/or bronze illumination, as well as bright colours, in an attempt to set them out as Jewish jewels for the Jewish child to behold. They are also distinguished from the background setting by being outlined in black or a metallic ... as a child might draw or paint. The Hamsa with God's eye watching over us has the staff tied to the index finger ... Adonai remembers! He will keep us connected to Him if we so choose! The dove is the bearer of peace to us all. 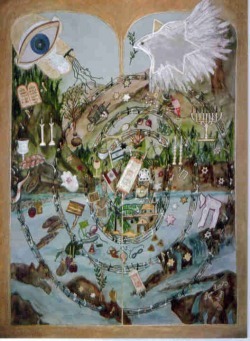 The journey commences with an image of the Ten Commandments and concludes with a Torah. The metaphorical intent is that this spiral will continue on with the next generation of Jewish children, and will be embarked upon yet again by their progeny. In musical terminology, I envision this to be the ultimate "Da Capo Al Fine" ... from the beginning to the end ... and then back to the beginning! There exists an old Jewish legend which states that upon the completion of the creation of humankind, God turned to the angels and asked for their opinion of the world which He had just designed. They responded that the only element which was lacking was the sounding of praise to the Creator. So, Elohim added music - the voices of birds, the whispering of winds, the murmuring of oceans; and planted melody in the hearts and minds of His people. In Israel's 60th year, I recall and relate to this awe-inspiring legend. At this time of celebration, I present this watercolour as a tribute to God's many blessings, which He has bestowed upon Israel. Surely every important occasion, every Simcha, must have its share of music! Therefore, musical signs and symbols are interwoven about and throughout the many other precious Israeli and Judaic motifs. The (music!) staff "parts" the sea; the fish represent the hopes and dreams of continuing growth and fertility for our Jewish population. Boundaries blur and shift from one image into the next - as the bounties of Shaddai ebb and flow (but never cease!) to His Israel. As a classically-trained soprano and music therapist, I "hear" this painting as one not bound or tied by any specific time, tonality, modality, timbre, key, pitch, range, or tessitura. Rather, one "melody" blends into another in aesthetic harmony. Many consider Miriam to have been the first female music therapist; her tambourine is clearly visible at the top of this watercolour. The oversized violin becomes the border of an ancient arch in Israel. A Hebrew "Shalom" bids us along the path to Jerusalem. The number 60 encircles two symbols of light, whilst the number 60 is encircled by 6 Stars of David, one for each decade of Israel's blessed existence. "Yom Huledet Sameyach" dances amongst the music notes, and a dancing sunflower (a metaphor for light and illumination) thanks Hashem for the abundance of blessings of life in Israel. Other flowers include Israel's Rose of Sharon. Some of these meld and blend with palm trees in a duet of joy. The violin bow reaches heavenward towards God, whilst the Yad extends earthward towards the Star of David, in a never-ending Rondo fashion. 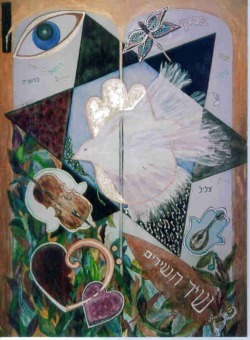 The harp of David - who is considered to have been another biblical music therapist - is clearly visible; it accompanies many other signs and symbols of Israel - moon, grapes, wine cup, menorah, mezuzah, hamsah, and dove with olive branch. Images exist within images; a section of the large Star of David becomes a decorative gift bow - a representational "Toda Rabah" to Adonai at this remarkable time ... Israel @ 60! As an accredited music therapist, working with those who suffer from mental illness, I was highly intrigued! My interest was definitely piqued! The question as to the "look" of RECOVERY in Mental Health had been posed at a workshop which I felt privileged to have attended. The challenge felt palpable as I contemplated an appropriate response. I searched - indeed grappled - for an adequate reply; one which would be visual, artistic, creative, sensitive, and meaningful. I also wished for my personal effort to provide a measure of aesthetic appeal. Inspiration and dedication played centre-stage roles throughout the artistic process. This watercolour is metaphorical; it represents my belief in, and vision of, RECOVERY. The painting is busy and interactive; it outgrows and overflows its borders. Flowers and foliage are of many varying colours, types, sizes, and shapes. The colours are more sombre in an almost imperceptible diagonal line across the page, from the bottom right corner to the top left corner. During the conception of this painterly journey, I first considered a horizontal line, but dismissed this idea as representing far too much repose (i.e. a body at rest); a vertical line was also given some consideration (i.e. a body standing upright), but did not allow for the dynamic tension which I sought to encompass. Hence, the decision on the diagonal line (i.e. a body on edge, a body at some risk, a body that might tumble) ... but also a body with the possibility of positive change, and hopefully, the probability of RECOVERY. As flowers and foliage move through and along this diagonal line, they are transformed from being somewhat small, dark, and tangled, to gaining in size, colour, and space. They become progressively more open and receptive as they proceed upwards towards the light. I have chosen to infuse this watercolour with metallic tones of gold, silver, and bronze to represent the "golden aura" of the individual ... the beauty often obscured by the illness. The dancing sunflower, bursting forth from some entanglement, represents an "ah-ha" moment ... one of discovery, of self-discovery, of vision. 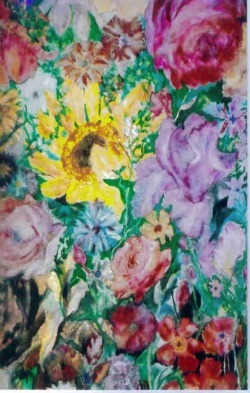 The brightly-hued flowers represent hope, potential, and fulfillment. Towards the bottom right of the painting is a hidden gift bow; this represents the gift of RECOVERY, for which we all (patients, family, friends, and staff) strive together as a team. This watercolour commenced with capricious intent ... an element of whimsy ... which gradually evolved in its significance. The heart is torn and broken; it is bleeding at its very centre. The left side is crazed and pale; it is "blue" as compared with its counterpart. However, the right side, with the aid of an oversized chocolate rose, flowers, other treats, and meaninful "sweets" of life, is much brighter and pinker in tone. 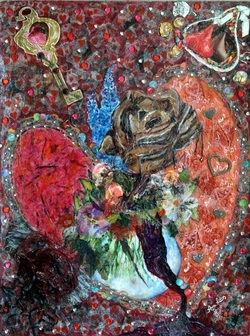 The entire heart is bound up and held together by a music staff of gold, with chocolate "kisses" and other goodies providing sustenance , whilst the heart attempt to heal itself. The key to this heart is one which envelopes a filled gooey chocolate. The smaller background hearts (i.e. a bevy of music therapists) are singing and dancing in an attempt to entertain the large, damaged one ... encouraging it along its path to recovery and eventual fulfillment.